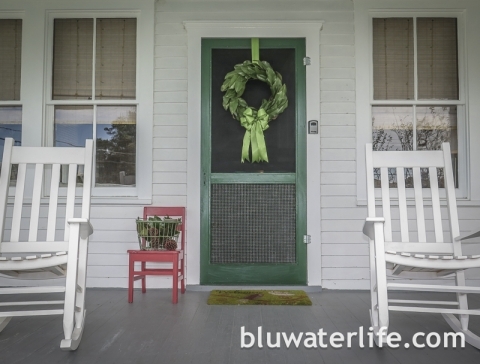 Do you recognize this screen door and fabulous porch? 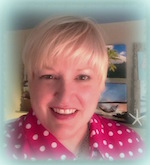 Yep, it’s from Sea Stars Cottage, where I stayed during my recent bluwatergetaway to Tybee Island. 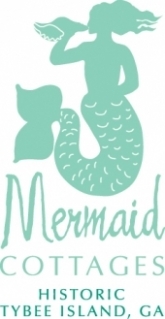 This charming Mermaid Cottage is the backdrop for some of my posts this week. 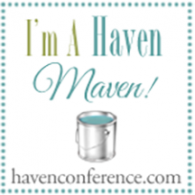 It was fun to enjoy a different space and create new looks. And the layout of this cottage worked well for me. I enjoyed doing projects during the week and loved having the downstairs space to stage my stuff and lay out what I needed. 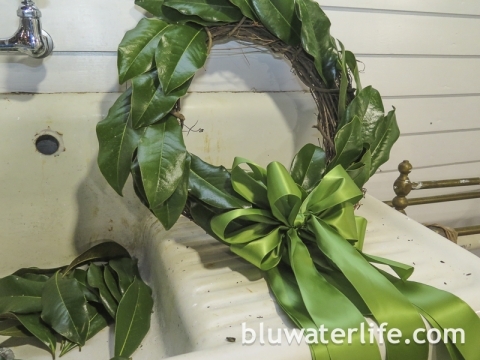 Here’s how to make the wreath ~ 30 minutes and less than $10! 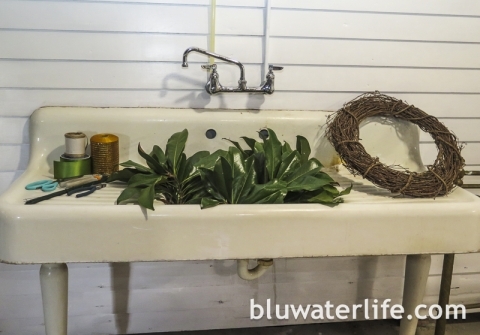 Loved having this space in the garage area of the cottage to put the wreath together. The grapevine wreath was $4.99 at Michael’s. 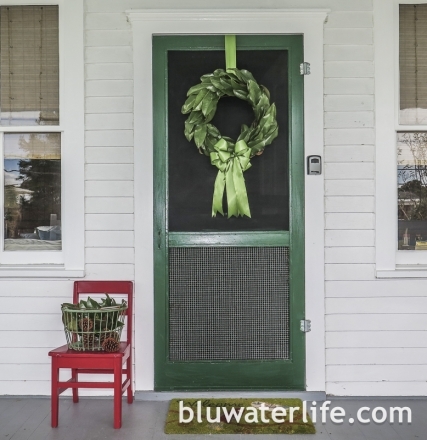 Look for one that has a sturdy vine wrapping the entire wreath form ~ that’s key to the project. 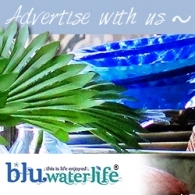 Start with the large leaves, inserting them under the study vine encircling the form. Work in a circle, overlapping right and left. 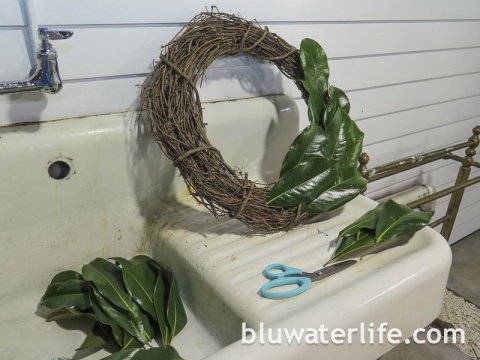 After the large leaves create the shape, you’ll go back and fill in with the other smaller leaves, pushing them into the woven vines all around the wreath. Continue working in a circle, layering leaves as you go. 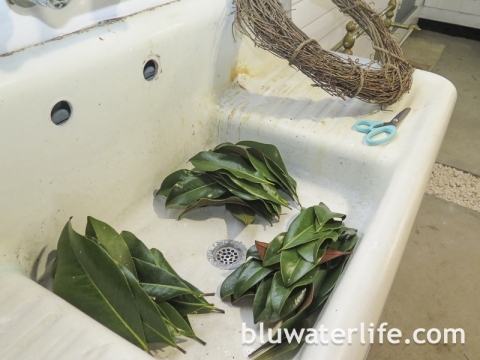 The medium leaves work well to fill the inner ring and outer edge, and then the small leaves are used to fill any gaps and add some overall dimension. The leaves hold each other in place and the result is surprisingly secure! It won’t hold up to windy conditions or a lot of door slamming, but it will certainly work for a special day or weekend. 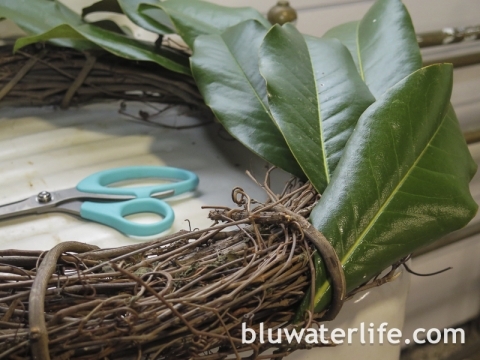 You can also wire each leaf into place for a longer lasting approach ~ it just takes longer to make the wreath. Using the “just push into place” method took less than 30 minutes, including the bow! 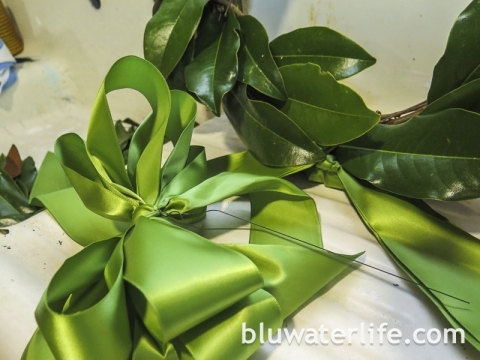 I tied ribbon in place to hold my bow, so I added the ribbon streamers before completing the large leaf layer. The bright green satin ribbon was left over from another project and I liked the fresh color contrast to the darker leaves. A ten loop bow, ready to go! As I said in yesterday’s gift wrap post, after years in visual merchandising I can tie just about any kind of bow. I help out friends when they need new wreath bows too, so feel free to ask! Wired ribbon would make this even easier ~ satin is slippery and can be a little temperamental for bows ~ but it certainly is pretty. So what do you think? I was really happy with the results and it makes me want to create a more permanent version for my door at home. 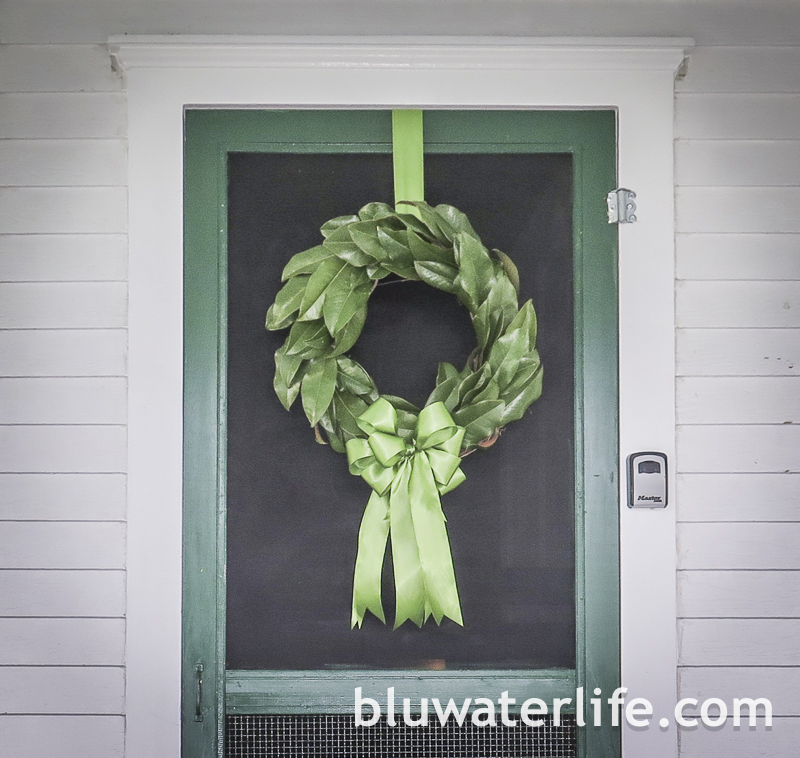 This kind of wreath really works year round in the south. 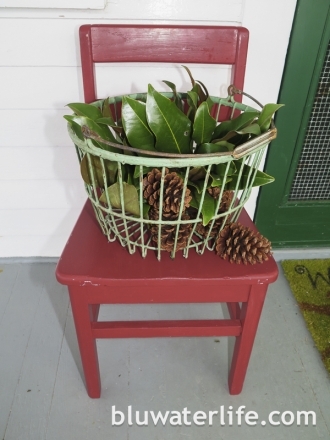 Magnolia trees abound on our property, and a change in ribbon color or a seasonal ornament add-on and this is easily a spring or fall wreath. Just save the grapevine form and use it over and over. Oh, and if anyone wants to leave some treats or a beautiful package, I’ll be sure there is a spot next to the door! 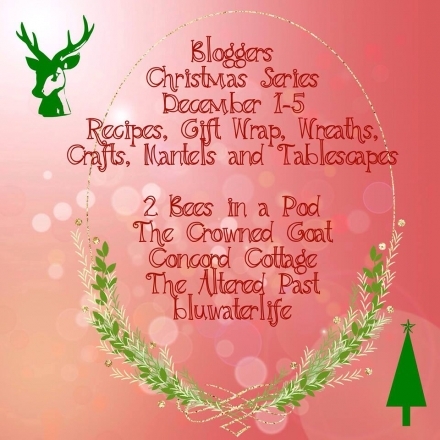 Check out more wreath ideas from my friends Vicki & Jennifer at 2 Bees in a Pod, Coco at The Crowned Goat, Lisa at Concord Cottage and Angie at The Altered Past. 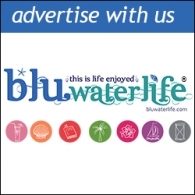 Each in our own special and different styles! 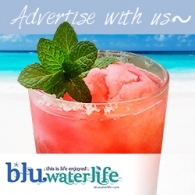 Bringing you something new from each blog, every day this week. Tomorrow it’s all about Christmas craft ideas – see you back here tomorrow! 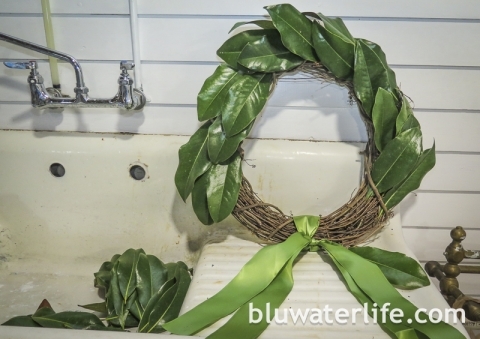 Fresh magnolia wreaths are pretty! I wish I a close neighbor with a tree so I could borrow some branches!